Headset W/ Battery. Part Type Headset System. The item listed is represented to the best of our ability. YOU WILL RECEIVE A RESPONSE WITHIN 24 HOURS. You are viewing a slightly used, but highly productive, Plantronics CS530 wireless headset, phone to base cable, and ac power adapter. For sale is a Plantronics Voyager Focus UC StereoBluetooth headset with Active Noise Canceling. It is tested and working great, and only lightly used! Every feature works great! Everything is included in the pictures EXCEPT THE TINY USB BLUETOOTH PLUG! For Sale are Plantronics H41N. 1 Plantronics H41N Headset. THE PLANTRONICS MIRAGE H41N HEADSET is stylish and unobtrusive, with a sculpted shape that fits perfectly behind either ear, eliminating the need for a headband. LOOK AT PHOTOS FOR ACTUAL CONDITION. You are viewing a slightly used, but highly productive, Plantronics Savi 730 wireless headset, phone to base cable, and ac power adapter. You are viewing a slightly used, but highly productive, Plantronics CS540 wireless headset, phone to base cable, and ac power adapter. Netcom GN 2000 USB Stereo Headset. 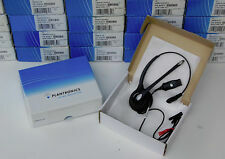 7x Plantronics M214C Headset ' Factory Sealed. This item is new sealed in box. Tested for Full Functions, R2/Ready for Reuse. Communicate clearly up to 350 feet away from your desk with the CS520 Binaural Wireless Headset from Plantronics. Designed to connect to your desk phone, the CS520 sports a sleek, lightweight design and has been comfort-tested. Headset in the photo is exact to be received. Jabra Evolve 75 MS Stereo Bluetooth Headset with Link 370 USB Adapter - Open Box. Shipped with USPS Priority Mail. Plantronics SupraPlus HW251N Black Headband Headset. Condition is New. Shipped with USPS Priority Mail. 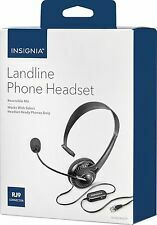 Plantronics H171N DuoPro Headset use w M22 & VOiP Voice Over IP QTY! For Sale are Plantronics H171N. 1 Plantronics H171N Headset (w New Ear Pad). DuoPro Headsets with. These units are professionally refurbished. A truly excellent headset! Noise Canceling Mic & Over-The-Head Headband. Plantronics Headset in very good condition. No major scratches. Tested all functions and everything works. Battery and the headband has been replaced with new ones. Sound is good, mic picks up fine, all buttons work and all lights functioning. New Plantronics Y Training Cords in Factory Sealed Packs. 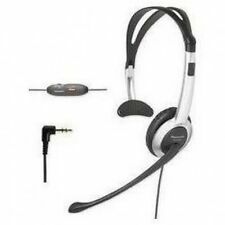 You are viewing a slightly used, but highly productive, Plantronics Savi 740 headset. Once you experience a Savi 700 headset system youÂ’ll wonder how you ever lived without it. 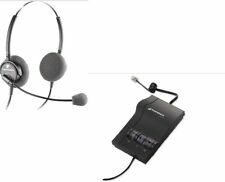 Plantronics W740/A-M, Microsoft Office Communicator 2007/Lync 2010 compatible wireless headset system. Plantronis Savi wireless headset system that connects to multiple devices but allows you to manage all calls from a single headset. 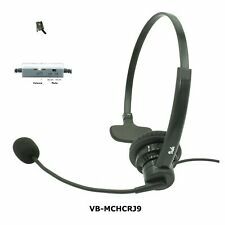 Jabra - GN Netcom 9300 Series Headset Neckband for Jabra GN9330e GN9350e. Refurbished Plantronics 83544-01 W720 Savi Triple Connectivity Binaural Wireless Headset. The W720 noise-canceling microphone reduces background noise interruptions. Voice-dedicated DECT technology eliminates Wi-Fi interference. By buying these cords, you can keep your existing headsets rather than having to buy new Polaris-versions. For Sale are New A10-16 Direct Connect Adapter Cable PN #66268-02. make Supersized seem small. For Sale are Plantronics H171N. 1 Plantronics H171N Headset (w New Ear Pad). DuoPro Noise Canceling Over-The-Ear Headsets. These units are professionally refurbished. A truly excellent headset! You receive the following (as pictured). For Sale are Plantronics H41. 1 Plantronics H41 Headset (fitted w NEW voice tube). THE PLANTRONICS MIRAGE H41 HEADSET is stylish and unobtrusive, with a sculpted shape that fits perfectly behind either ear, eliminating the need for a headband. If a correct phone number is not provided, we will cancel the order. DO NOT include tech support. Local Pickup: There is no local pickup fee. This is so we can file a claim with the carrier. USA Warehouse. Plantronics HW251N is GREAT for VoIP phones (Cisco, Avaya, etc). An Ultra Noise-Canceling microphone filters out excessive background sound to further heighten call clarity. Designed for over-the-head comfort, the HW251N SupraPlus Wideband lets users choose between experiencing total-focus sound reduction (Binaural - 2 ear design - Plantronics HW261N) or conversing easily with coworkers without removing the headset (Monaural design - this headset). The Plantronics CS50 Wireless Headset system is the best in wireless and hands free conversations for your office phone. And when you’re away from your desk, you're still in touch to think and talk on your feet, either answering or ending a call with the touch of a button with the optional Plantronics HL10 Lifter or Hookswitch. LIGHTLY USED. pRODUCT WAS TESTED AND WORKED PROPERLY. 1 Plantronics HW261 SupraPlus Headset. For Sale are Plantronics HW261. SupraPlus Binaural Voice Tube Headsets. Wideband audio for more natural sound and clearer conversations. These units are tested, cleaned and in EXCELLENT condition! Panasonic KX-TCA400 Over The Head Headset Mic. Condition is Used. Shipped with USPS First Class Package. In great shape. Any questions please ask!! Part Type Wired Headset. Headset W/ Ear Muff. 27190-01 Polaris QD Cable. The item listed is represented to the best of our ability. Plantronics H41 Corded Headset Refurbished unit, tested and 100% operational. • Quick-Disconnect lets you unplug and walk away. 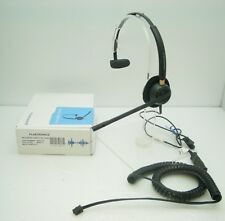 Radio Shack Hands-Free Headset Voice Activated NEW SEALED. Condition is New. Shipped with USPS Priority Mail. Enjoy amazing sound for calls and music with the Jabra Evolve 40 Headset. This black wired headset features a cable length of 4 ft. for convenient usage. Its 3.5 mm jack allows you to easily transfer your Skype calls to your smartphone. Two-year warranty. Plantronics H151 DuoPro Over-The-Ear Voice. It requires a Plantronics M22 headset ampliufier which is not included. Microphone: Voice tube—Plantronics’ trademark design, light weight and unobtrusive. Plantronics Savi W740 Headset System. Complete Unit Ready to Go. Live Line Tested. Manufacturer: Jabra. Compatibility: Jabra headsets. Not Included: headset. to assist you. Wire Transfers.